The creators of South Park and Ron English selected 15 artists to pay tribute to the 15th season of South Park at an art show that opens on March 28th at Opera Gallery in New York City. The show runs through April 10th. Kicking off “South Park’s” 15th anniversary celebration, COMEDY CENTRAL and pop surrealist painter, Ron English, have joined forces to curate 15 Artists Interpret South Park at Opera Gallery New York beginning on Monday, March 28. 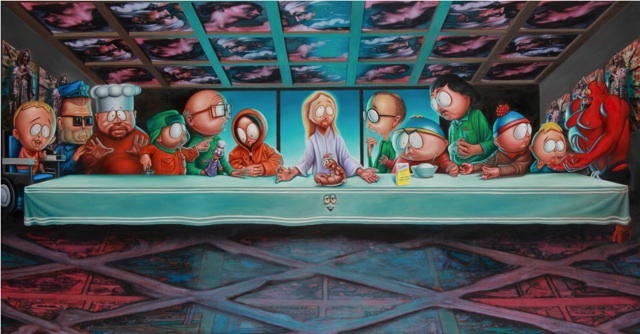 Famed street artist and pop surrealist painter, Ron English, has hand-picked 14 artists who are drawn from the street and the pop surrealism movement to join him in displaying their South Park interpretations. The artists are unified by their love of the hit series and the passion they bring to their work. Their interpretations feature the South Park characters and the iconic moments throughout the series history. The featured artists include: Ron English, Travis Louie, Colin Christian, Sas Christian, Beau Stanton, Kid Zoom, Dave White, KaNo, Kathie Olivas, Clark Fox, Greg Craola Simkins, Mark Dean Veca, Lindsey Way, Naoto Hattori and TrustoCorp. The 15 Artists Interpret South Park exhibit will be on display at Opera Gallery New York beginning March 28 through April 10. This summer the 15 Artists Interpret South Park exhibit will be traveling to Comic-Con in San Diego for COMEDY CENTRALs Ultimate South Park Fan Experience. In addition, South Park fans can submit their own artistic interpretations at SouthParkStudios.com from March 28 to May 15. Ron English and the South Park staff will select the 15 best pieces and these will also be included in the Ultimate Fan Experience at Comic-Con.